Most of us intuitively know it’s importance. We use it in our language. Our sense of it guides how we interact with others, and how others interact with us. Today, you’ll hear the case for trust, and not how it merely exists along side other things, but how it needs to come first. Hey, it’s Andrew, and this is Safety on Tap. Since you’re listening in, you must be a leader wanting to grow yourself and drastically improve health and safety along the way. Welcome to you, you’re in the right place. If this is your first time listening in, thanks for joining us and well done for trying something different to improve! And of course welcome back to all of you wonderful regular listeners. Clive Lloyd joins me today. Clive grabbed my attention for a few reasons. First, he came highly recommended by people I trust. Beautifully ironic give the focus of our conversation. Second, he is generous in helping people like you and I learn and grow and succeed. And thirdly, the focus of his work is on a topic close to my heart, which I didn’t realise wasn’t just important in my own experience, but what the academic literature says is vital to effective change. Such is my curiosity that I did a little searching, and despite the fact that this is the first time we’ve talked about trust as a specific topic on the Safety on Tap podcast, there are no less than 10 other episodes which bring up trust. Before we get to Clive, this is episode 97 of the Safety on Tap Podcast. I can’t begin to tell you how much fun this learning journey has been with you, it has been honestly surprising how enlightening, challenging and uplifting this podcast production has become for me. But the best bit is our connectedness – how a community of likeminded people from all over the world have come together as they listen and engage and challenge and share. A while back I changed my title from CEO to the Chief Connector – because that best describes the value I create, by connecting people with new ideas, by connecting people with each other, and connecting people with their fuller potential, a better version of themselves. Like me, helping you. None of this progress, nothing about Safety on Tap, exists without you. So firstly, thank you. Nextly, I want to showcase you to celebrate the upcoming 100th episode. Like in episode 50, I want to put a bunch of listeners on the air to share your reflections about impactful episodes, guests, ideas or actions which have helped you to improve yourself and health and safety in your work. That might sound uncomfortable for some of you, which means that’s exactly what you need to do to grow, and I would appreciate it immensely, along with all our listeners. Don’t shy away from it. If you want to say thanks to me, and help others, send me an email and we’ll get your reflection on the air, it’s really easy. Don’t delay, episode 100 is fast approaching! 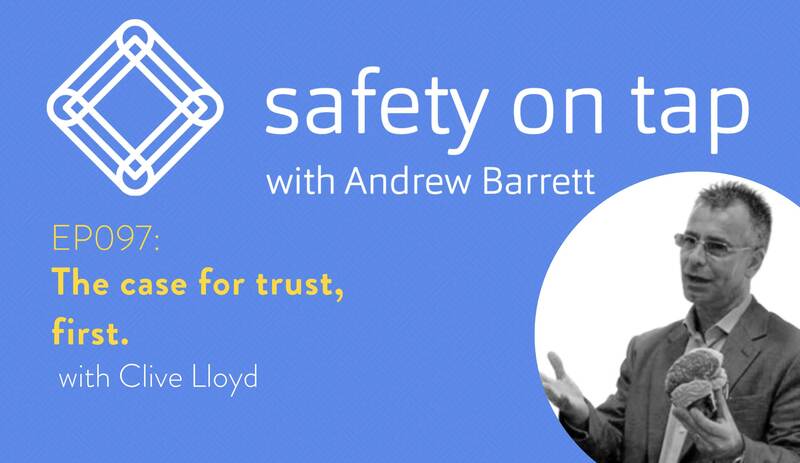 Before my takeaways from that wonderful chat with Clive, please do send me an email to andrew@safetyontap.com and let me know you want to contribute to our 100th episode, and we’ll make that happen. I’d love to hear from you. I also have some availability in the first quarter of next year if you would like me to help you with an event, workshop, strategy session or team development. Last week I helped a wonderfully values based company facilitate a project risk workshop. We had the client, contractors, engineers, suppliers, designers, and unusual in my experience both the developer AND the investor attend the workshop. Such a diverse group, such varying expectations, and such little time. It’s also one of those things we know we need to do, but can so often be painful, boring, or at worst a waste of time going through the motions. The approach we took was described as ‘like no other risk workshop I’ve done before’, and another said ‘this was the best workshop I’ve ever attended’. One person mentioned they were highly sceptical of the approach at the beginning, and were pleasantly surprised by how valuable the day was for them. Bringing people together is an expensive exercise however you look at it, so you wan to make the most of it. If you would like help to bring some people together, send me an email andrew@safetyontap.com and let’s see what we might do. Takeaway #1: Sometimes, we need to drop the safety word to work on safety. There is an increasing body of research and opinion which suggests that safety culture ‘aint a thing, it’s just culture. Then on leadership, sure we talk about and describe and influence safety leadership, but as Clive suggests safety comes when just leadership improves. The challenge we face as professionals is that increasingly, we need to work less on stuff labelled, or obviously about health and safety. What would that look like for you? What are you already doing where you’ve dropped the safety word, and getting good results? How can you move yourself, your team, and your organisation to a better future where the words health and safety are less, but actual health and safety is more? Takeaway #2: It doesn’t matter what you do, start with trust. The title of this episode says it all. Like I said at the beginning, I intuitively knew this, but it kind of hit me like a brick during this chat. Our challenge then is to work out how will we work on trust? It has the same challenge at the first takeaway, where it’s not labelled safety. That shouldn’t stop us. How does trust work with your own relationships? Your teams? Your entire function? How might you look for and influence trust, and it’s three core components, through your systems and strategy? Takeaway #3: Be careful with care. Clive’s rationale is stunningly simple and clear, why he and his team focus so much on care, or benevolence. My only reflection on this is that the word care, often is abused in safety. We throw it around, usually describing a lack of it in an individual, team or company. That worker just needed to show more care. That leader just needs to care more. No one around here cares about safety. I encourage you to explore how you, as Clive does, can support an increase in the conveyance and perception of care. Just be careful how it might come across, given that word is so often abused. Thanks so much for listening. Until next time, what’s the one thing you’ll do to take positive, effective or rewarding action, to grow yourself, and drastically improve health and safety along the way? Seeya! – my handwritten notes, PLUS a reflection template for you to use for this episode. – The full transcript of this episode. I’ll also send you the links to all the available back-catalogue of reflection templates and transcripts so you can access these at any time. Great podcast. Clive you are so practical in your approach. It is refreshing to see this. Sometimes I think we make “safety” so complex we lose the essence of what we are trying to achieve. Systems may need to be detailed and complex in some workplaces due to the risks, but the link between safety and trust is a simple universal message. I agree Leanne. The interesting challenge for us as professionals, is how are we intentionally, strategically, and broadly building trust? I put it in the same bucket as ‘influence’ – it can be understood and changed, but we think its magic, or luck, or inherent skill if you have it or not. I challenge that widely held notion!